The Olgas are in many ways much more interesting than the rock as you can walk among them and sense more of their size. 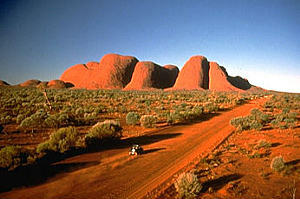 Their make up is quite different from Uluru and there is much vegetation all around. We did a great walk called the Valley of the Winds and you can really hear the wind calling to you - Stephen was quite inspired as he thought it incredible that the sky was so blue - bluer than he had ever seen, the Olgas so read and the different greens of the trees and the spinifex. He has done another picture. The trip has produced more art from Stephen than he manages at school!! The red also produces a lot of very dirty people in our family - but you just have to get used to that !! The trailer is really dust proof, so that the clean clothes do stay clean (if you don't wear them that is!). In fact the trailer has been really fabulous very sturdy and comfortable at night. It was a good investment for the trip.